Filler, Director of the Teamsters Public Services Division. police and correctional officers employed by local and county governments in the state. country including officers at correctional facilities, city police forces and sheriff’s deputies. us on Twitter @Teamsters and “Like” us on Facebook at www.facebook.com/teamsters. The International Brotherhood of Teamsters hopes to consolidate resources and expand its base in Pennsylvania by forming a statewide association of law enforcement and correctional officers, union leaders announced Thursday. The Pennsylvania Law Enforcement and Correctional Officers Association will bring together the locals representing more than 100 county and municipal agencies and more than 2,000 police, deputies, and prison guards statewide. The association "will provide an increased level of representation and protection that is unmatched in our state," said Bill Hamilton, president of the Pennsylvania Conference of Teamsters. The announcement came at a news conference in King of Prussia, just a few miles from the Montgomery County Correctional Facility, where 235 prison guards will vote Monday on joining Teamsters Local 384. Hamilton said prisons are an area ripe for union expansion. "We believe these correctional facilities in particular have a real meaningful future in the state of Pennsylvania because they're largely unrepresented in many, many areas," he said. Leaders of the state Fraternal Order of Police attended the news conference and said afterward that they applaud the Teamsters' attempt to expand guard unions. "But when it comes to the representation of police officers, we strongly believe the only representation that can be given is by police officers themselves," said Pennsylvania FOP president Les Neri. 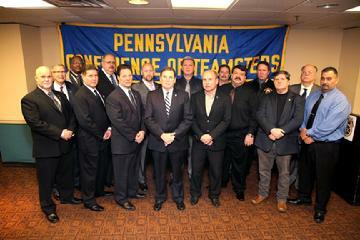 Neri said that although the Teamsters represent many smaller police departments in Western Pennsylvania, the FOP would continue to dominate urban departments and most of Southeast Pennsylvania. "Imagine a Teamster police officer pulling over a Teamster truck driver," Neri said, adding that the appearance of a conflict of interest justifies keeping police officers separate. Carl Bailey, a former McKeesport, Pa., police detective who leads Teamsters Local 205 outside Pittsburgh, said he respects the FOP. "I wish we had a better relationship because I think we're all fighting for the same things," he said. However, Bailey doesn't see police departments as FOP territory. In fact, he said, his staff was working Thursday to bring in another department from Fayette County. "Hopefully that'll be my 51st police department coming onto my local," he said. "It's a growing industry." Teamsters Local 384 organizer Chris O'Donnell said the Teamsters "need to get more of a presence" in correctional facilities across the state. "It's very prevalent in Harrisburg and the western part of the state," he said, but there's a "dire need" in Montgomery County and other areas. Teamsters leaders said there was no effort yet to organize prison guards in Chester County or Delaware County, where two African American guards are suing the operator of the county facility for alleged racial discrimination. (Harrisburg, PA) “I and my fellow Business Agent Mario Garofalo began a campaign with the help of the Stewards of the department to inform the public of what the Council was working to do, it was the Borough's intention to get rid of the Police and Fire department and getting rid of the Teamsters who represent those departments”, said Business Agent Eckert. “Today I am happy to say that our efforts paid off, once we got the word out it became the talk of the town people began to show up at the meetings, so many showed up in fact that the meetings had to be moved to accommodate the crowd of supporters, finally when the election came the entire board along with the Mayor were voted out and a new board took over, as a result of that happening we sat down with the new board and Mayor and began talks of extending the contract”, added Eckert. This is an unprecedented contract by virtue of the fact that the IBT has never seen a contract this long. Members also approved a 12-year contract extension with the borough's police department. West York Borough Council voted unanimously to extend a collective bargaining agreement with the borough police department. The agreement adds on 12 years to the current contract, securing an arrangement through 2028, and allows for a two percent cost-of-living pay increase each year for the borough's eight officers beginning in 2017. The current contract, a three-year contract that began this year and will end in 2017, allows for no pay increase this year, and then a 1 percent pay increase in both 2016 and 2017. The 12-year contract extension includes a clause regarding health insurance that ensures for "good faith" negotiations between the department and borough if costs rise — meaning that the officers would be expected to pay a higher portion of their healthcare bill if it increases, Council president Brian Wilson said. "This is one big step in really ensuring that West York Borough will have a police department for a very long time," he said. Correction: The original story incorrectly stated the contract extension that West York Borough Council approved Monday night was a 15-year extension. However, Council President Brian Wilson clarified Tuesday that the contract extension is for 12 years. "It really isn't 15 more years, it's 12 more years," Wilson said. "It's actually a 12-year extension...It's guaranteed that we have a police department for the next 15 years, until 2028." Wilson said borough council's excitement over the contract extension likely contributed to confusion over the length of the contract during Monday's council meeting. The contract extension allows for a 2 percent cost-of-living pay increase each year of the extension, and that will begin when the current contract extension expires at the end of 2016. 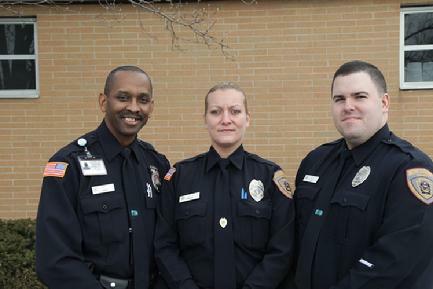 This year, the officers will see no pay increase, and in both 2015 and 2016, officers will see a 1 percent pay increase. Following an eight-month-long organizing campaign, a majority of the 235 correctional officers working at the Montgomery County Correctional Facility near Norristown, Pa., voted for representation by Local 384. The local already represents more than 800 public services employees in the area and is a member of the Teamsters’ newly created Pennsylvania Law Enforcement and Correctional Officers Association. Montgomery County Correctional Facility is a medium-maximum security prison facility. The facility houses 2,000 inmates and each day there are more than 150 visitors. It’s a sprawling complex and Teamster correctional officers are responsible for the overall security of the inmates, visitors and fellow officers. Soon, the bargaining unit of correctional officers will be meeting to hammer out a draft of their first contract and begin the negotiating process with the prison’s warden and management committee. “Once the contract is in place, the officers will be able to plan their work lives because they will have their salary, leave and other policies in writing in a Teamster contract,” O’Donnell said. “Representation on the job is what I am looking forward to in our Teamster contract, and I want a contract so that the favoritism will end,” said Jen Rigler, a seven-year employee who serves as a transport officer and is part of reception control. The local’s ongoing representation of county probation officers and deputy sheriffs was a big reason the prison correctional officers voted for Local 384, according to Mike Bonaducci, the local’s President. With the organizing victory in Montgomery County, Pa., Teamsters now represent more than 2,000 law enforcement professionals in the state. This was a primary reason why, in December 2013, the Pennsylvania Conference of Teamsters voted and approved the creation of the Pennsylvania Law Enforcement and Correctional Officers Association. “This statewide effort to organize law enforcement officers needs to have coordinated resources and to rely on the expertise of Teamster locals who have effectively represented public employees throughout Pennsylvania,” said Bill Hamilton, International Vice President and President of the Conference. “Creating the Pennsylvania Law Enforcement and Correctional Officers Association will give us the ability to focus our organizing strength to its best advantage. The newly created association is already bringing dignity to the more than two dozen police departments and correctional facilities that are Teamster-organized in the state. “I commend the Pennsylvania Conference for taking the initiative to create a structure that will improve organizing and negotiating for public employees who want the best representation possible,” said Michael Filler, Director of the Teamsters Public Services Division.